If you are a user of federal court Case Management and Electronic Case Filing (CM/ECF), then you are already familiar with the transition to PDF/A for electronic filing of court documents. Perhaps you have searched for a quick, easy way to convert your PDFs. You could use your mouse and follow the eight steps described in this blog post* by Rick Borstein, author of the Acrobat for Legal Professionals Blog. Remember keyboard shortcuts? We used them with impunity in early versions of WordPerfect and Word, but what have they done for us lately? Perhaps you’re like me and have fallen out of the habit. I blame it in part on the touch screen technology of smartphones and tablets. But when Jim Calloway of the Oklahoma Bar Association challenged me to find and publish a shortcut to saving PDFs in PDF/A format, I responded “Game on!” (Actually, I think I said “Good idea, Jim!”) Here are two keyboard sequences for your consideration. UPPERCASE is used solely to make these shortcuts easier to read, please don’t hold down the <Shift> key – it isn’t necessary. Hold down the <Alt> key, type “F,” then A M A. Notice you are now in the Save As dialog box with PDF/A selected under “Save as type.” Click Settings… and follow the steps described in Rick Borstein’s blog post. The radio button “Save as PDF/A-1b” and check box “Apply Corrections” should already be chosen. Leave these two options selected for the reasons given by Rick Borstein. Open a PDF and try it: <Alt> F A M A <Alt> E, check “Create PDF/A-1b according to the following PDF/A-1b conversion profile” and click OK. Write <Alt> F A M A <Alt> E on a post-it note and keep it by your monitor until you have the shortcut memorized. Can’t I Use a Macro To Do This? 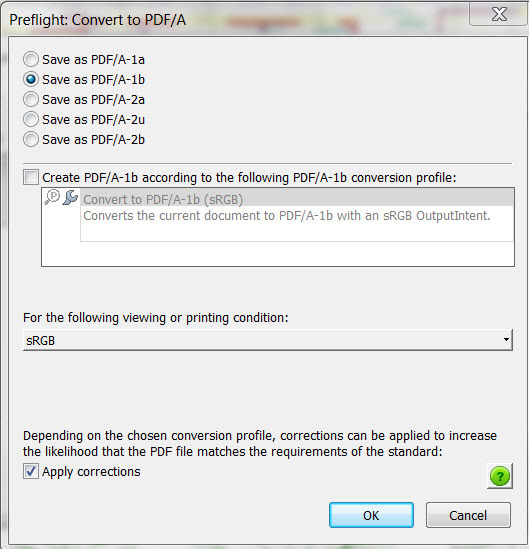 Macros (or Actions) in Acrobat can be used to automate any number of steps, including “Preflight Print Production,” which is what we’re doing when we save to PDF/A. This will be the subject of my next post. My thanks to Jim Calloway of the Oklahoma Bar Association for the idea and to Barron Henley of Affinity Consulting who inspired me. I’ve heard Barron speak many times at the ABATECHSHOW. More recently, we were fortunate enough to have him come out for presentations on Acrobat and going paperless. Thank you Jim and Barron! * Note – due to a numbering glitch in Rick’s post, the steps jump from “5” back to “3,” but there are eight steps if you use your mouse to “File, Save As PDF/A.” If you can’t wait until next week to read about Actions (macros) for saving to PDF/A, then check out this post. This entry was posted in Court Procedure, E-Court, Technology and tagged ABATECHSHOW, Acrobat, Acrobat for Legal Professionals, Acrolaw, Affinity Consulting, Barron Henley, Beverly Michaelis, CM/ECF, ecourt, Jim Calloway, keyboard shortcuts, Oklahoma Bar Association, Oregon law practice management, PDF, PDF/A, Rick Borstein, Technology by beverlym. Bookmark the permalink. Thanks Beverly. You can very easily convert to PDF/A as well reliably verify the PDF/A format with pdfDocs from DocsCorp. For those who do not have Acrobat Pro and/or want an easy and affordable PDF/A solution, pdfDocs is a locally proven alternative. Thank you Bob! Good information.